Puppley always travel in groups with there parents and they keep them hidden. This makes them very rare and eluisive for this reason. If these Pokemon let out a howl there pack won't be far behind. This Pokemon can run almost as fast as Pikachu when hunting its prey. It uses its intimidating looks and sharp claws to take down its opponents. This Pokemon is known for being stealthly and fast. This Pokemon can Howl at 57dB and can leave devasting attacks with its teeth and its razor sharp leaves in its pelt. 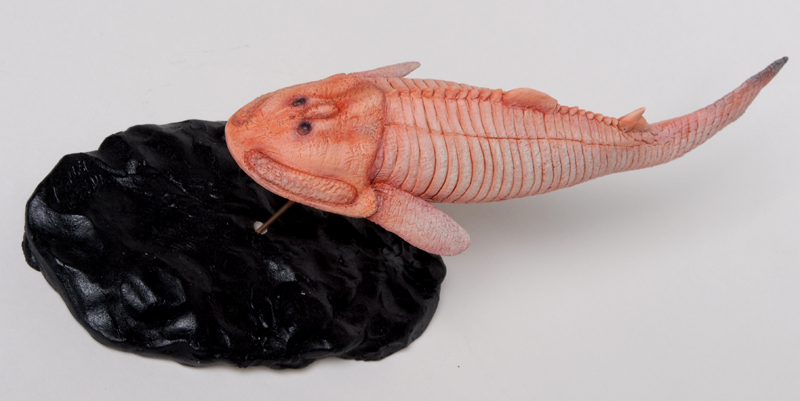 This Pokemon lives in rivers and streams in dams made by trees they had cut down with their sharp teeth. 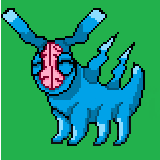 This Pokemon cuts down trees by slamming its teeth into trees then bitting down with the force almost equavilent of a Hippowdown. This Pokemon uses its axe sharp teeth to take out full sized magohony trees. Its builds full houes upon larges rushing lakes and can be seen in most famous lakes. This Pokemon can has better eyesight than most bats and uses its flammable wings to help see and scrare away predators. Pyrfang uses its rough flammable skin to live in live Volcanoes. Some say they have seen this pokemon dive into lava and come out wiht no burns. This Pokemon can create explosive powder and blows it out and combusts it at the same time with its flammable wings. It can use its Psychic powers to help it see and even pick up large boulders. Spriting is still a WIP. These are starters for a game btw. The Beavit line looks to be your Water-type starter, but it's known for cutting down trees-it'll be kind of strange if it's weak to Grass. The Embat line's ability is fun, but it kinda lags behind the others. Where Barkling and Beavit have abilities that depends on the player's actions, Embat's depends on the opponents actions-and it depends on the opponent using a move that's not very effective. This might be too complicated an idea, but what if Flammable triggered when Embat used a Fire-type move, at the cost of some HP? I edited the grammar mistake and gave Embat's line a new ability. I was also thinking about that whole beaver cutting down tree thing, I was thinking about giving him a light screen like move, that makes him not very effective to grass type moves Or giving him a different ability. Here's most of my game's roster standing next to their Ultra forms. Definitely wanna tweak a bunch of them, but for now they look good enough for me to move on to another dev task and come back to them later. What do you guys think? Gimmie your favorite of the bunch and the worst of the lot. Well, I don't exactly like the pony-like features of most, that's just me, but I have to admit that all of them look very good and most importantly different. The ones I most like are, from first image, the 2 and 4 from the second row; and especially 5 and 6 from the first row. Also, from the seven row, the 5 is great. I also like that they all are differently-sized. As from 'bad' ones, I think the 9th from the 4th row looks too bland. Anyways, this probs hasn't been helpful, but just throwing my opinions out there haha. No way, that feedback is SUPER helpful! 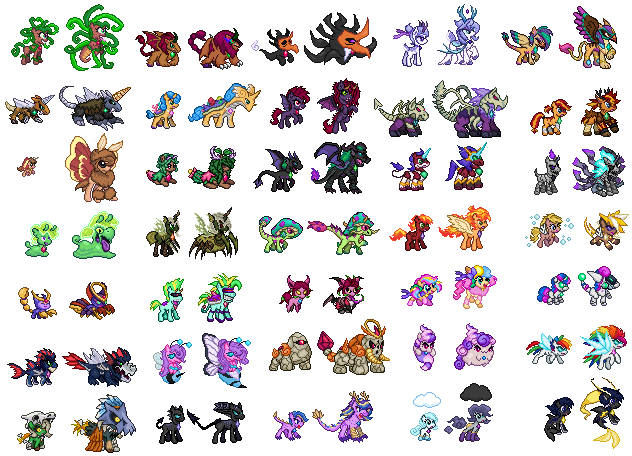 I'm trying to bring gaps here and make the game appeal to everyone, even those who aren't too keen on the pony aesthetic. The goal is to charm and delight at every turn the way Sonic Mania & Mario Odyssey do. And a key part of that is the variety of character designs that appeals to every type of player, so everyone has a favorite and nobody hates a particular one too much. 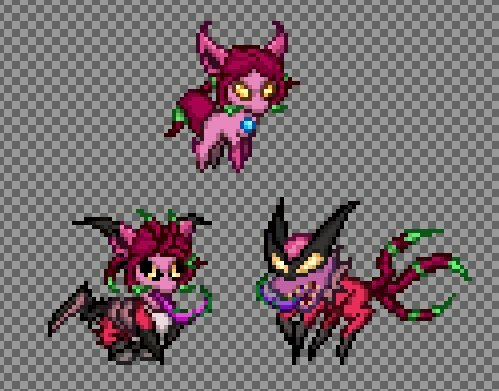 I haven't sprited any fakemon in a good minute, so id like some feedback on these ones i made in about mmmmmm 4 hours? Both each taking 2 hours max. One clearly doesnt really look pokemon like, and one looks like a vivosaur from fossil fighters, thats at least my interpretation of them, but what do yall think? Good, wierd, bad? Depthero: ice dragon/ dinosaur looking thing, again, looks like a vivosaur,, but i kind of like it a lot more than Bergythica. Either way, i still need more practice if i want to be... adequate. Here's a pokemon I designed with intent for it to be the water starter in a fakemon region. 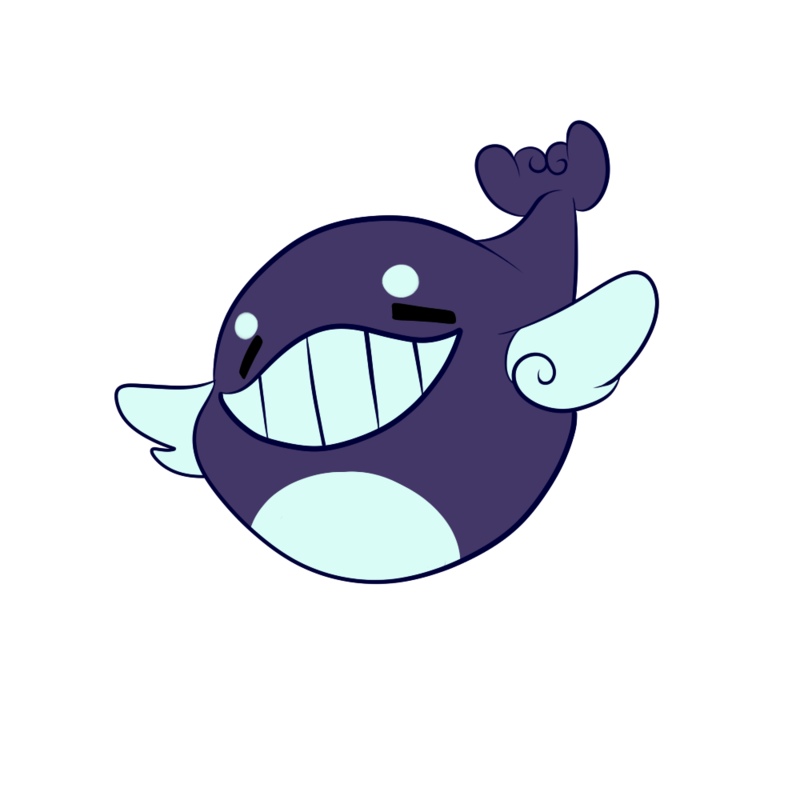 He's Water/Flying type based off an Orca and a Balloon. I'm thinkin' Righty is more readable. I can put the hair thing going on with Lefty in one of the base form's attack animations. I think the design on the left looks more like Vamparas, since the whole head snout/hair/ears keep the shape. The one on the right seems to do of its' own thing, but like you said it does feel more readable since there's more space between the legs and tails...after thinking about it I think I might like it as a head swap. Hmm... A head swap. Didn't think of that. Might just lead to a happy compromise between designs. 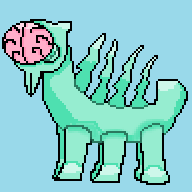 This Pokemon Thrived in the ancient Ocean, when Life exploded in the Sea, it uses it's unusually Complex Brain to convince prey it's a fellow member of their Species. What is a Halucigenia Dextogenia? So that's a pretty cute interpretation, but I think the sprite itself could use some work when it comes to coloring. I was going to adjust the shading with this example but I realize that's probably not intentional, the different shades are caused by some kind of image compression right? Anyway, I'd make some changes similar to this, opening up the tops of the legs so it's clear that it has multiples on one side of its' body. The brain looking part on the head really stands out, but I think could use some detail to make it look less flat; I'm not sure if the shading there is intentional or compression again, but the color is pretty subtle and a darker one would probably help. Halucaline seems to be developing legs for Going on land, this Pokemon confused Scientists for a long time, they couldn't figure out what were it's legs, it feeds by using Halucinations to trick Prey into Approaching. 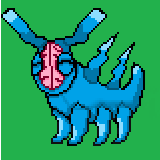 Oh, man, Hallucigenia is one of the coolest animals and there definitely need to be more fakemon based on it! You have excellent taste, my friend. -Have you considered making the lines for the brain folds a dark pink instead of black, like you did with dextogenia? It would look a little softer and more natural, while still keeping the folds nice and visible and still keeping it easy to tell what that shape is. Also, about halucaline's stats: those are... really strong, haha. I mean, it's your fake, and it should have whatever stats you like, but I just wanted to be sure that you're aware that, added together (total 620), those stats make halucaline more powerful than a good chunk of legendary and mythical pokémon (trios are usually total 580, mythicals are usually total 600). You're only a few points shy of something like kyurem or groudon there! If halucaline is supposed to be on par with mid-range legendaries then you're totally fine, but most regular pokémon have much lower stat totals than that unless they have a detrimental ability—take slaking, for example, who has the same 670 base stat total as groudon/kyogre but has to deal with not being able to attack every other turn. If you don't want halucaline to be as strong as a legendary, you'll probably want to lop off around 100 points from what you've got currently. Dropping down to ~520 would put you in the same range as the current most powerful fossils, tyrantrum and aurorus (521). Still pretty tough, but, like, not suddenly more powerful than suicune or darkrai, haha. If you're open to suggestions, maybe take some off of its attack and speed? It definitely looks like a tank and has a big brain perfect for a psychic with high special attack, so keeping its defenses/sp. atk and lowering attack and speed probably wouldn't hurt the concept much... although maybe your idea of how it battles is different from mine, so make whatever adjustments (if any) you think fit! these two are from the same evolutionary line based off terror birds. I’d love any feed back I can get! And of course here are my starters!